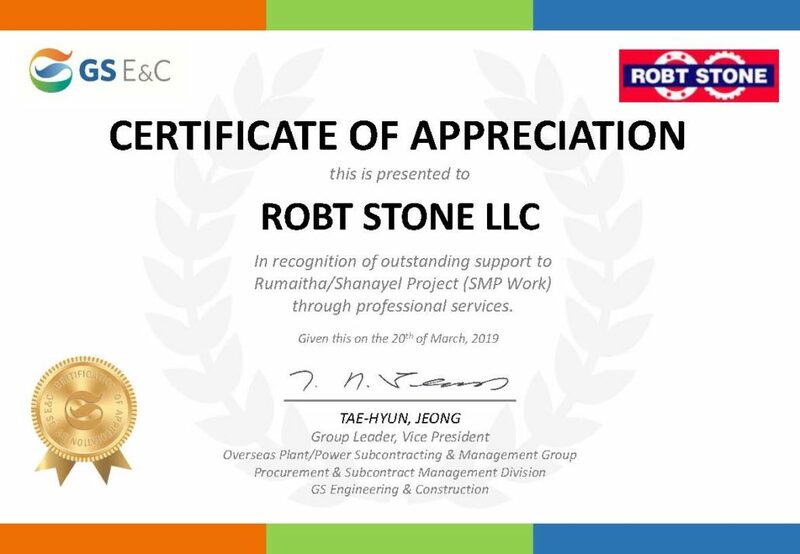 Certificate of Appreciation from GS Engineering & Construction for Outstanding support to Rumaitha/Shanayal Project (SMP Work) through Professional Services. 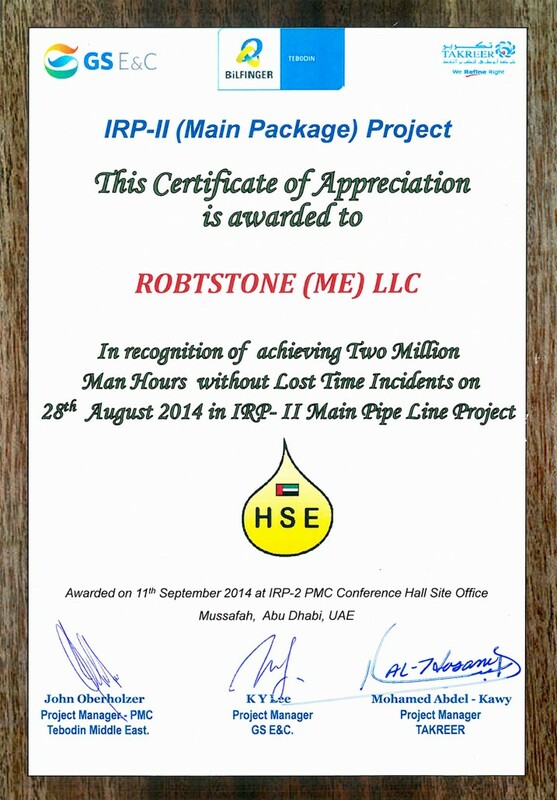 We congratulate all our TEAM members for their contribution for this achievement. 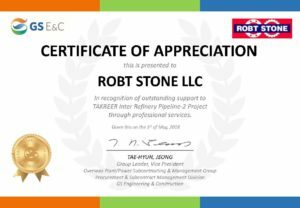 Certificate of Appreciation from GS Engineering & Construction for Outstanding support to TAKREER Inter Refinery Pipeline – II Project. 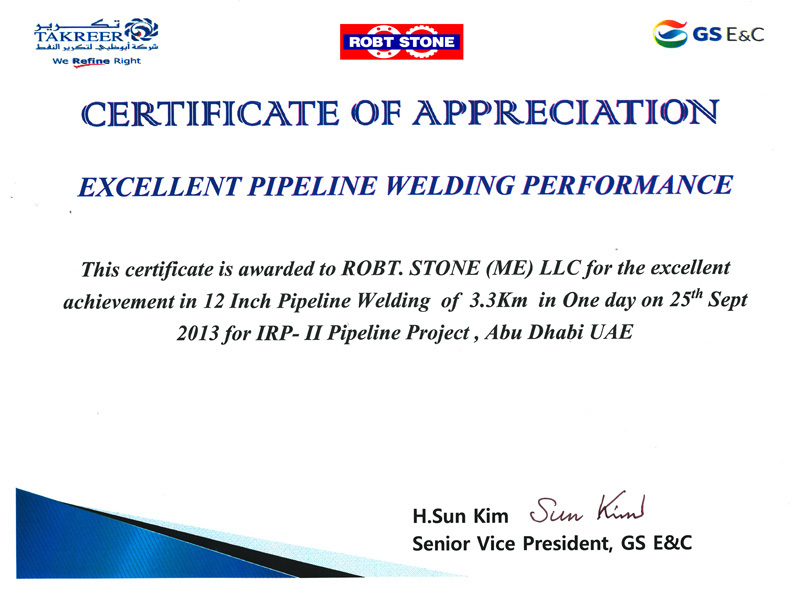 Robt. 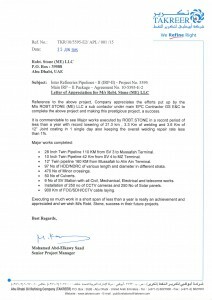 Stone’s CMD Mr. V.K. 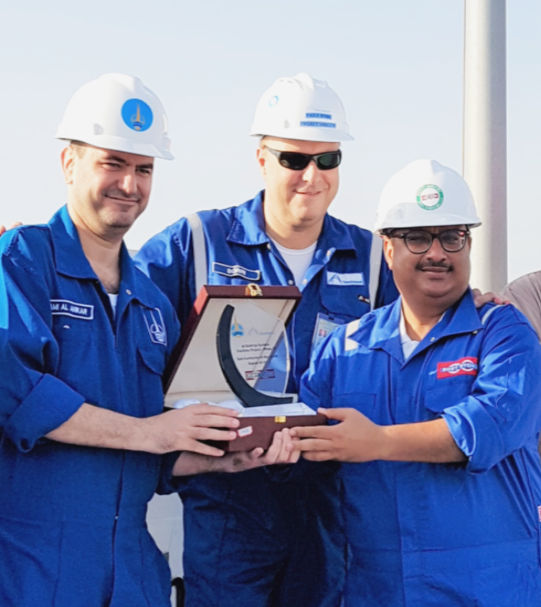 Madan and Director – Projects, Mr. Amit Kaura receiving “Subcontractor of the Month Award” (April 2018) from Sr. Project Manager (ADNOC Onshore) Mr. Wael Al Messabi and Project Director (Tecnimont), Mr. Borri Paolo for Al Dabbiya Surface Facilities Phase III Project. 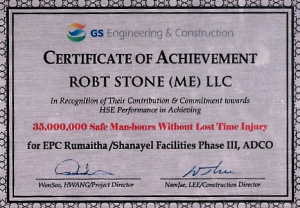 Certificate of Achievement from GS E&C / ADCO in recognition of contribution for achieving Thirty Five Million Safe Man-Hours without Lost Time Injury (LTI) for ADCO’s EPC Rumaitha/Shanayel Facilities Phase-III Project, Abu Dhabi, U.A.E. 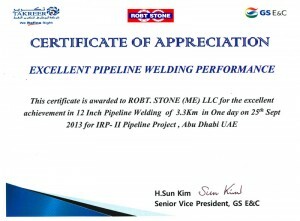 Robt. 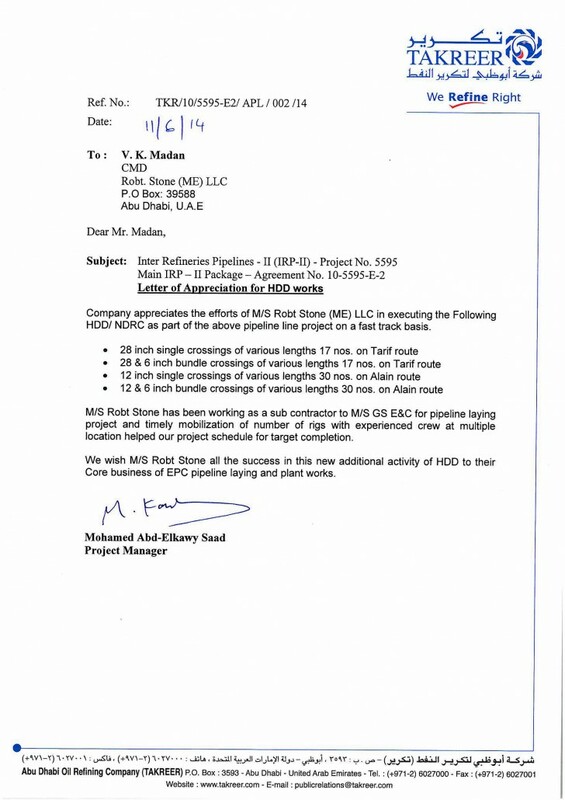 Stone’s CMD Mr. V.K. 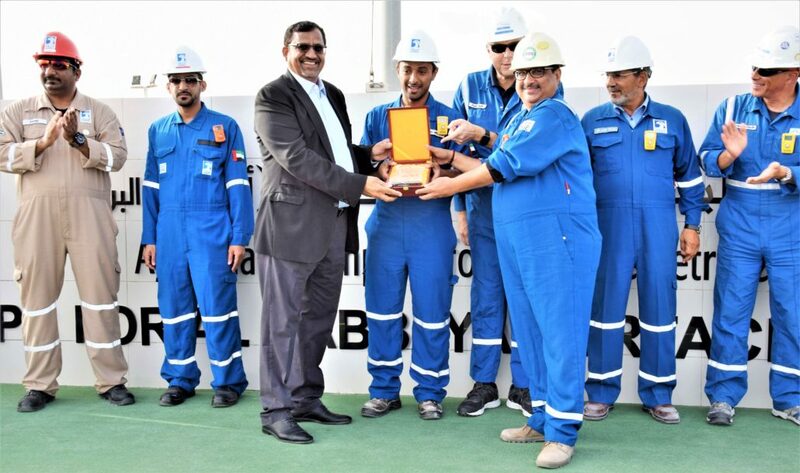 Madan and Director – Projects, Mr. Amit Kaura receiving Certificate of Appreciation from Mr. Khaled Al Anataly (ADNOC Onshore), Sr. Project Manager (ADNOC Onshore) Mr. Wael Al Messabi and Project Director (Tecnimont), Mr. Borri Paolo for an outstanding Health, Safety & Environment (HSE) milestone by achieving 5 million Man Hours without Lost Time Incidents (LTI) for Al Dabbiya Surface Facilities Phase III Project. 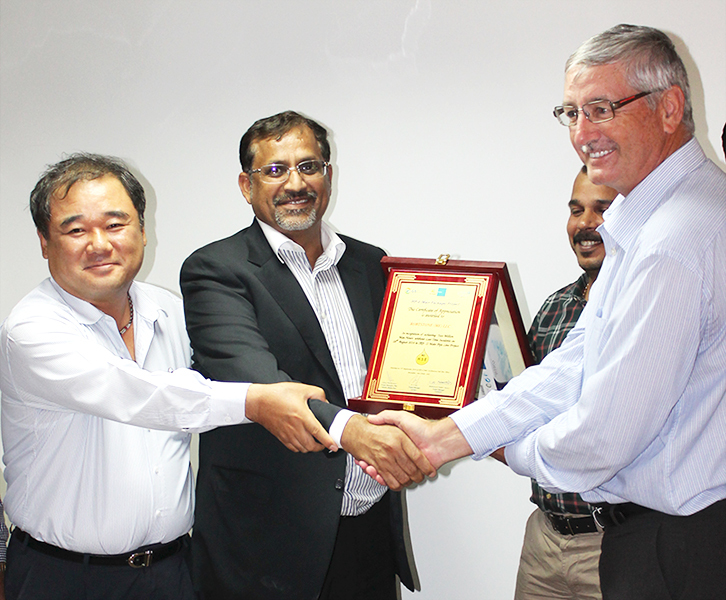 Robt.Stone’s Director Projects, Mr. Amit Kaura, Mr. Suresh Bose (PM) and Mr. Prakash (HSE Manager) receiving the “Certificate of HSE Excellence” as Best Subcontractor from GS E&C’s Construction Director, Mr. Nam Jae Lee in recognition of effectiveness of our HSE Management System for ADCO’s Rumaitha & Shanayel Phase III Project in Abu Dhabi. 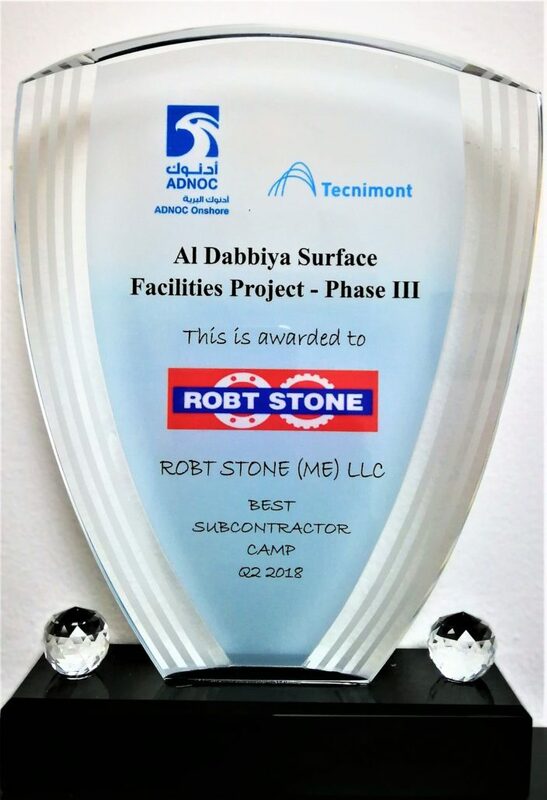 Robt.Stone’s Director – Projects, Mr. Amit Kaura receiving “Subcontractor of the Month Award” (August 2016) from Sr. Project Manager (ADCO), Mr. Sami Al Ankar and Project Director (Tecnimont), Mr. Borri Paolo for Al Dabbiya Surface Facilities Phase III Project. 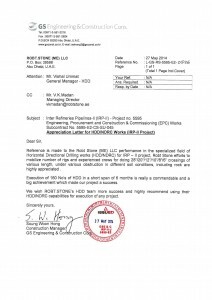 Letter of Appreciation from TAKREER for Exceptional Works carried out for completing the massive scope in a short span of time for their IRP-II Project. 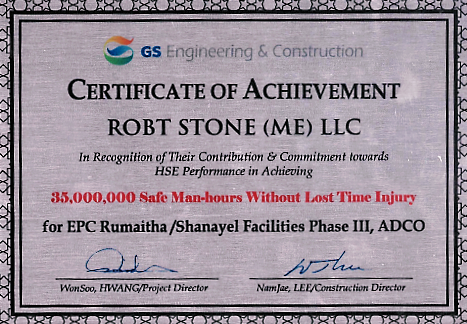 HSE Appreciation Certificate received from GS E&C / TAKREER in recognition of contribution for achieving EIGHT Million Man-Hours without LTI in TAKREER IRP-II Project, Abu Dhabi, U.A.E. 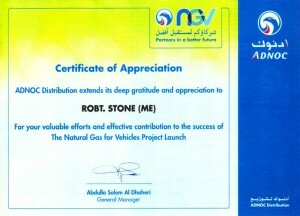 Robt. Stone’s Managing Director Mr. V.K. 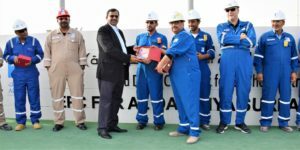 Madan receiving a certificate of appreciation from the PMC (Tebodin Middle East) in recognition for a major HSE achievement for accomplishing THREE Million Man-Hours without Lost Time Incidents (LTI) during the execution of their TAKREER IRP II Project. 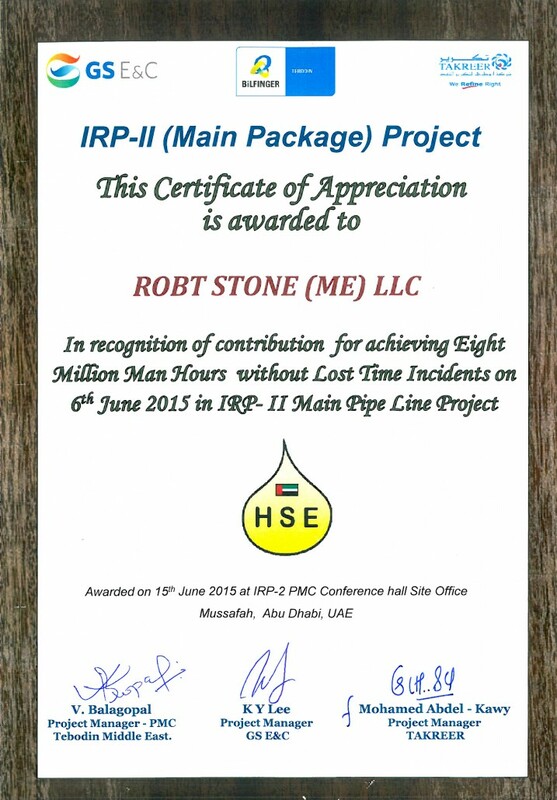 Robt.Stone accomplishes new HSE Milestone for achieving THREE Million Man-Hours without LTI in TAKREER IRP-II Project, Abu Dhabi, U.A.E. 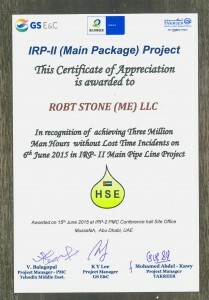 HSE Appreciation Certificate received from Our Client / Contractor (TAKREER, PMC & GS E&C) for achieving TWO Million Man hours without LTI in TAKREER IRP-II project. 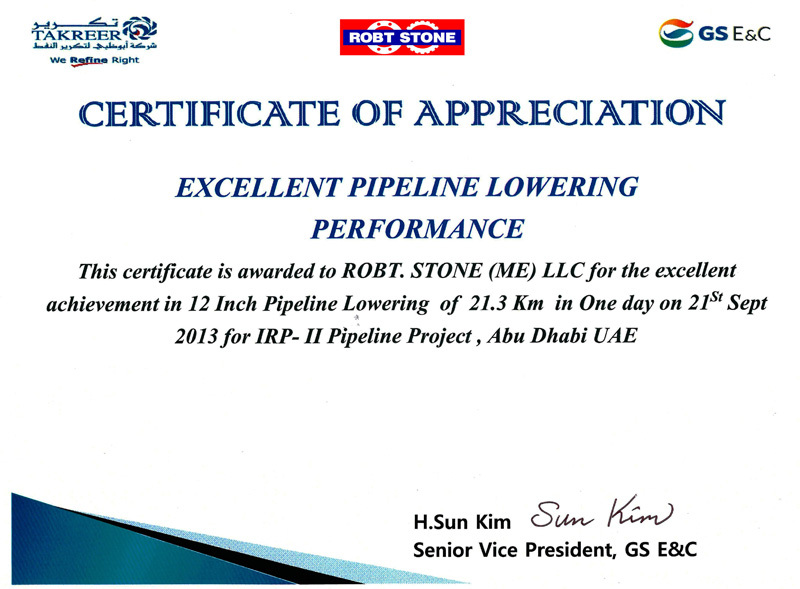 Robt. 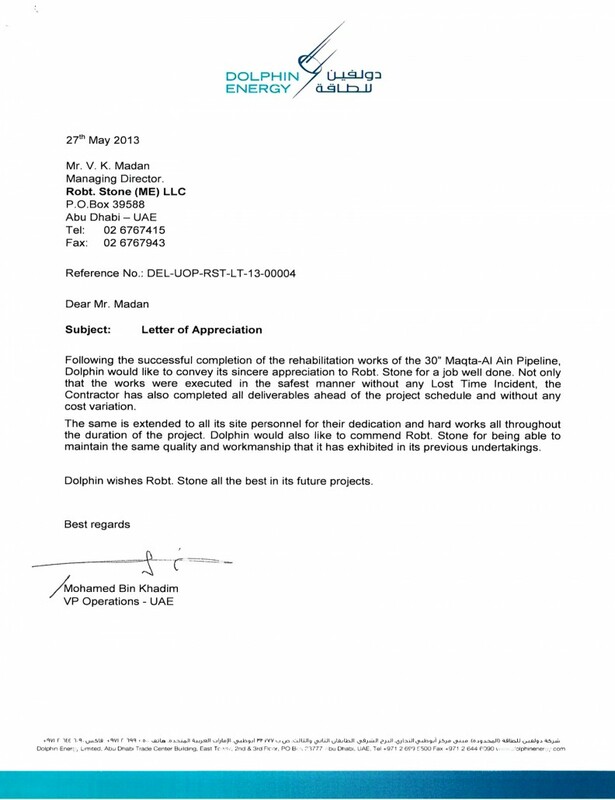 Stone’s Managing Director Mr. V.K. 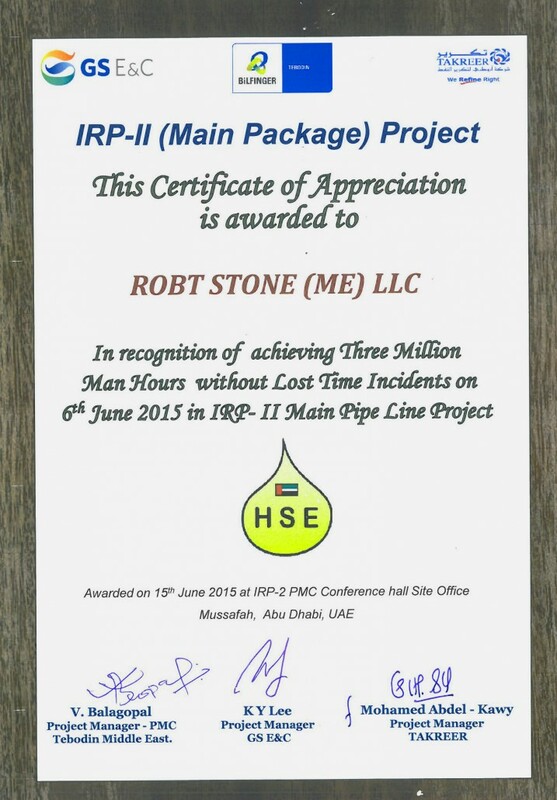 Madan receiving certificate of appreciation for an outstanding Health, Safety & Environment (HSE) milestone by achieving 2 million man hours without Lost Time Incidents (LTI) during the execution of their TAKREER IRP II Project from Main Contractor G.S Engineering & Construction and PMC Tebodin Middle East. 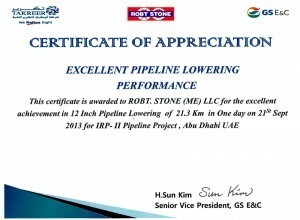 Robt. 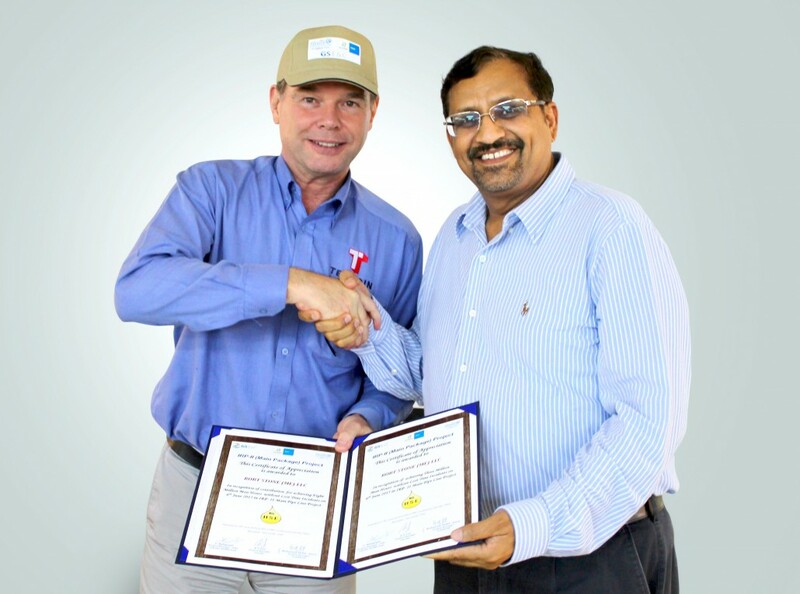 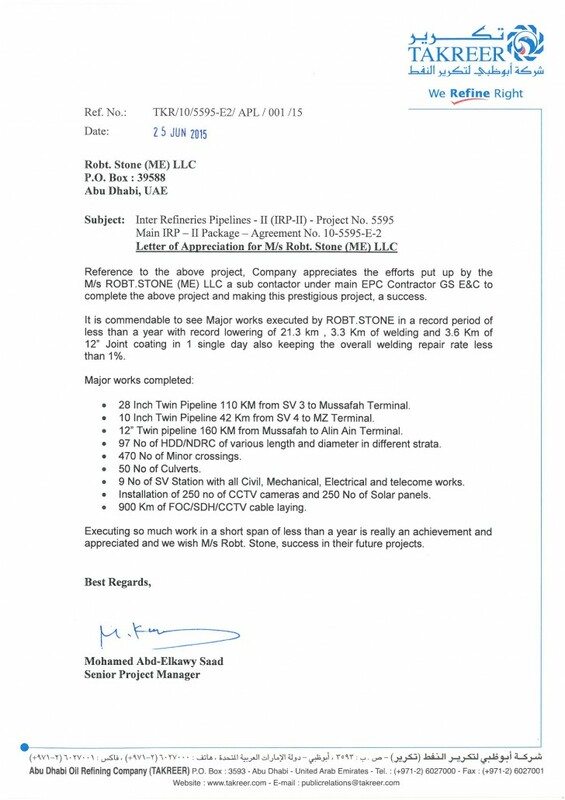 Stone received Letter of Appreciation from TAKREER for successfully carrying out Horizontal Directional Drilling works on Fast Track basis for TAKREER IRP II Project. 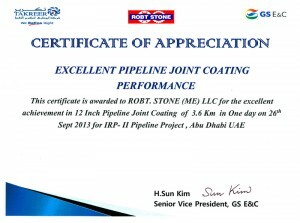 Robt. 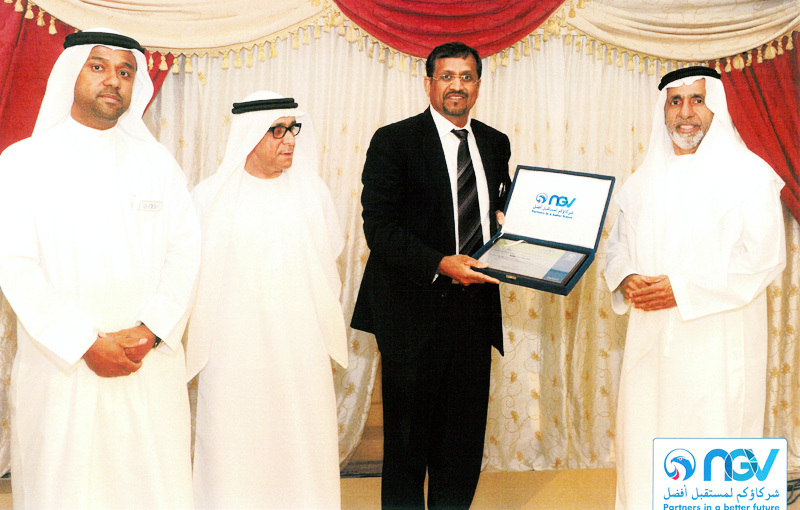 Stone Managing Director Mr. V.K. 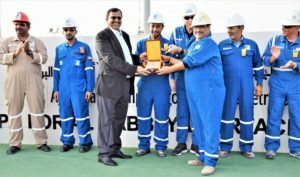 Madan receiving certificate of excellence in Execution of TAKREER IRP II Project from Main Contractor G.S Engineering & Construction. Robt. 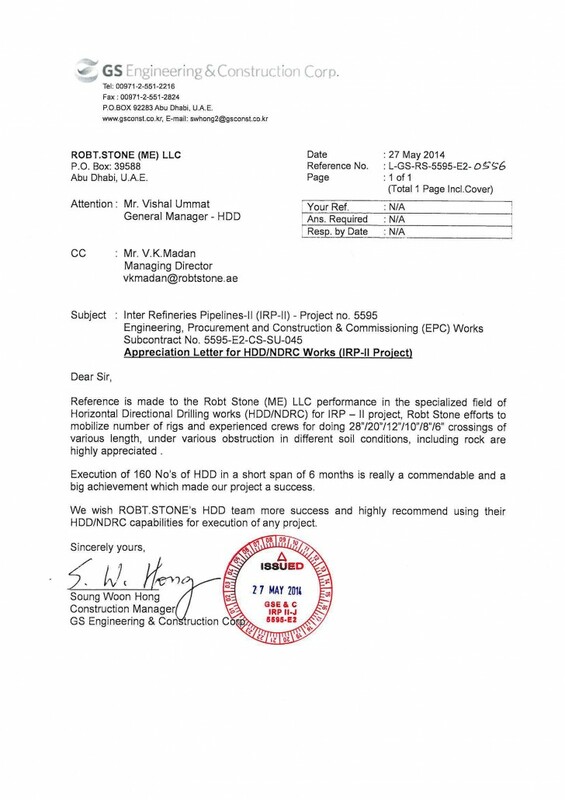 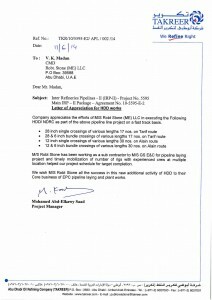 Stone received Letter of Appreciation from Main contractor of TAKREER IRP II Project, GS E&C, S.Korea for successfully carrying out Horizontal Directional Drilling / NDRC works. 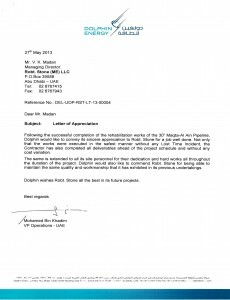 Letter of Appreciation for High Safe and timely completion without any cost variations for Dolphin Energy Pipeline rehabilitation works during 2012-2013. 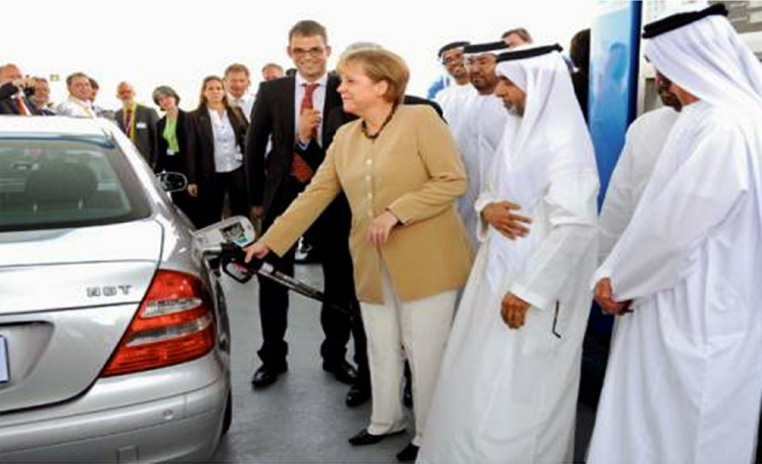 Angela Merkal inaugurates a natural Gas filling station of the German company Bauer in Masdar City. 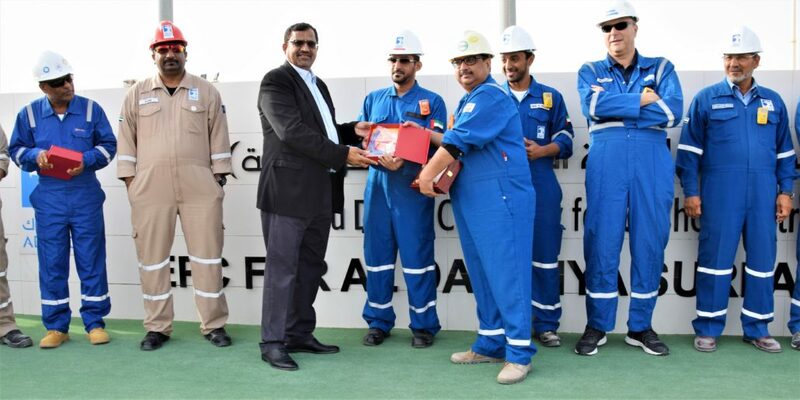 As Abdullah Nasser Al Suwaidi, Deputy CEO of Abu Dhabi National Oil Company (ADNOC) and other officials look on. Certification of Appreciation awarded to Robt. 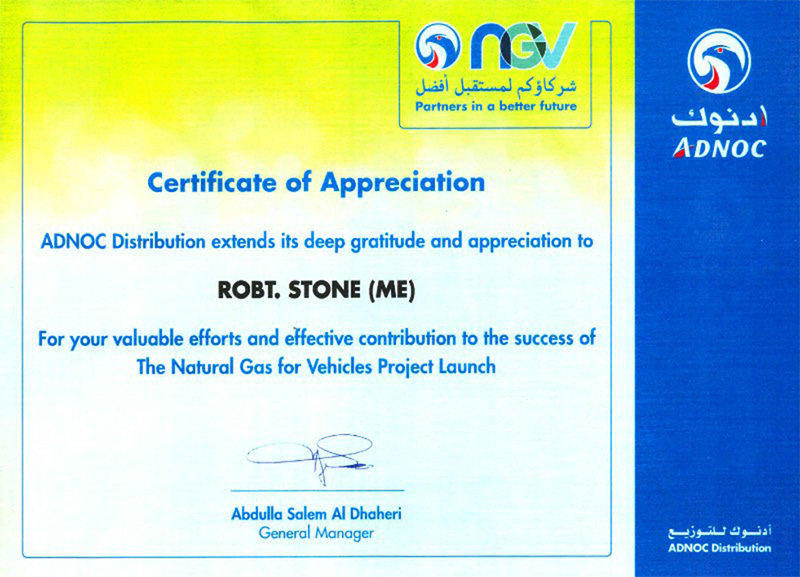 Stone for the Natural Gas for Vehicles (NGV) successful completion and execution. 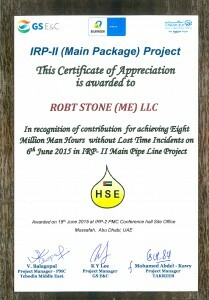 Certificate of Appreciation from GS Engineering & Construction for Excellence in pipeline lowering for TAKREER IRP-II project. 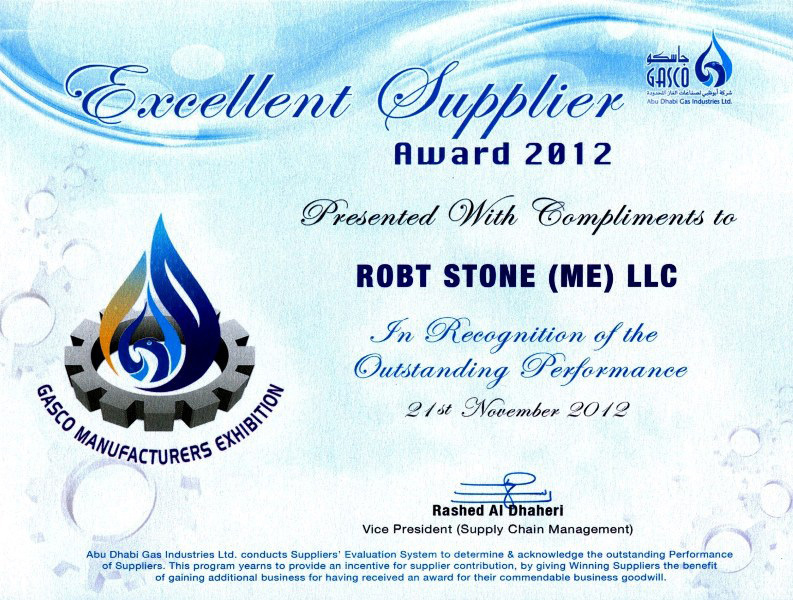 Robt. 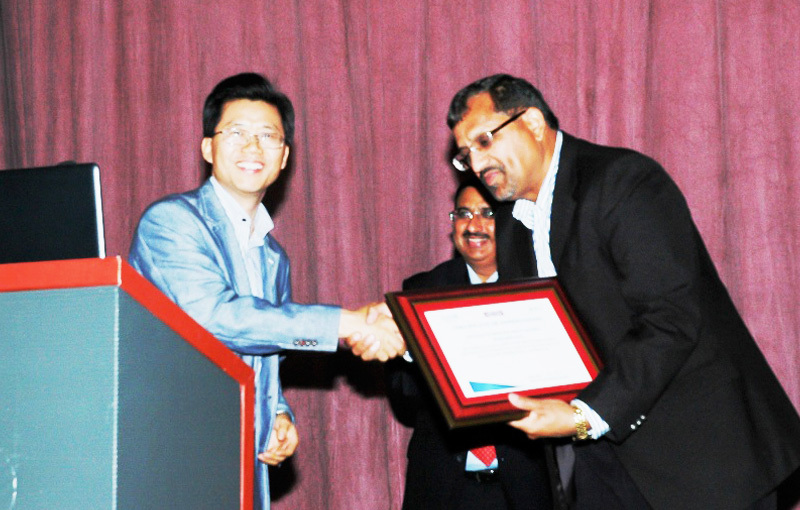 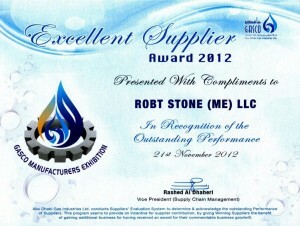 Stone received Excellent Supplier Award-2012 from Gasco for Outstanding works as contractor in the year 2012. 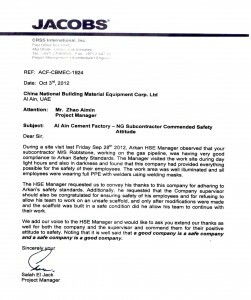 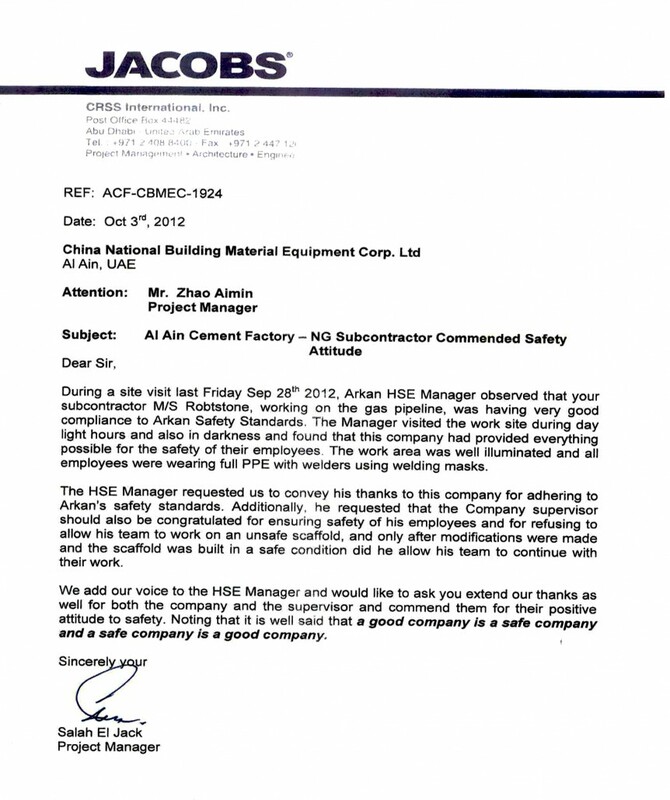 Letter of Appreciation for High Safety and compliance to client safety standards during execution of tie-in and pipeline commissioning works at Al Ain Cement Factory in 2012. 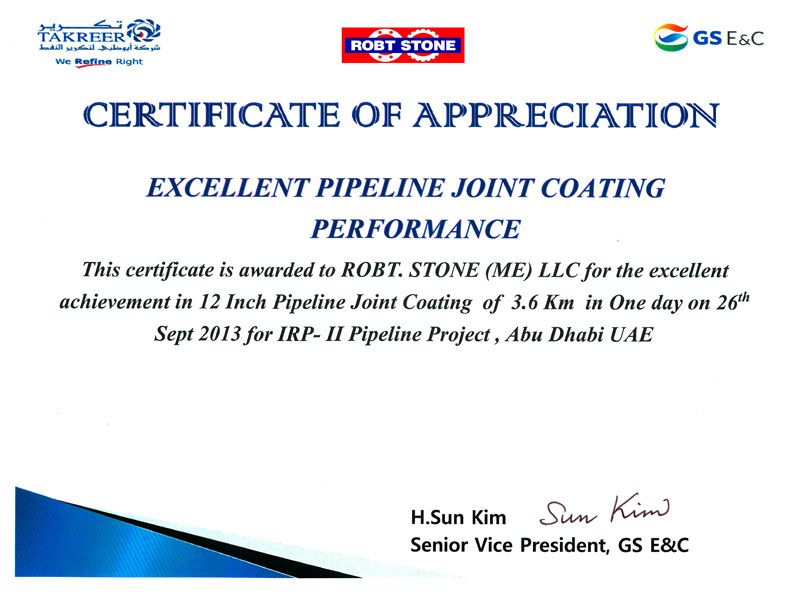 Certificate of Appreciation from GS Engineering & Construction for Excellence in pipeline joint coating for TAKREER IRP-II project. 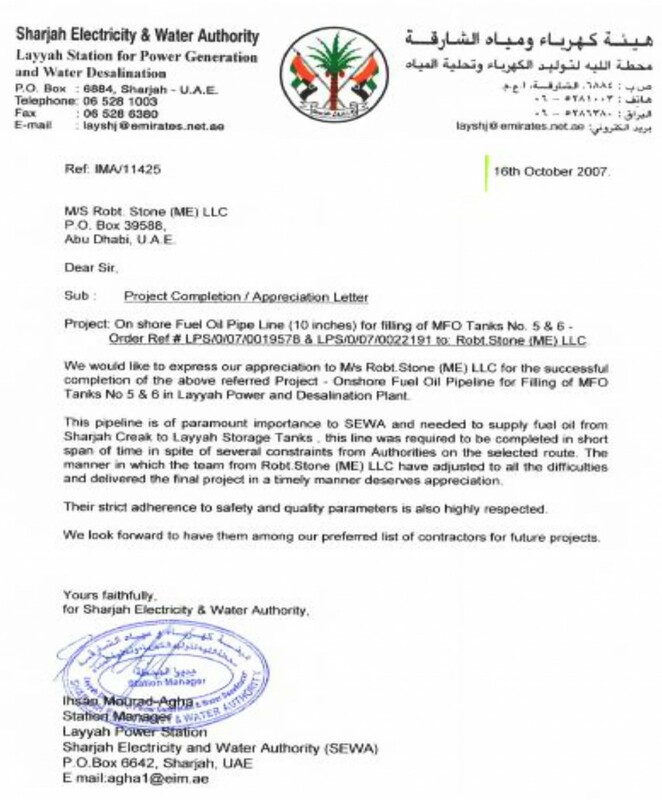 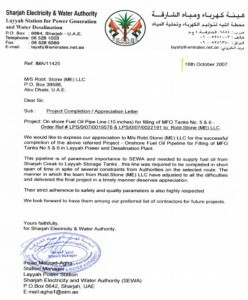 Letter of Appreciation for strict adherence to Quality and Safety standards together with timely completion of 10” pipeline construction works for SEWA (Sharjah Electricity and Water Authority) in 2007.